I was at the store last week looking for premixed tile adhesive. There were two versions and as I was trying to decide between them, I was reading the labels. The regular version had a warning against using it on painted surfaces. Well that’s out, my basement floor is painted! Checked the premium version… same warning. Oh. Back at home, a little research confirmed it. 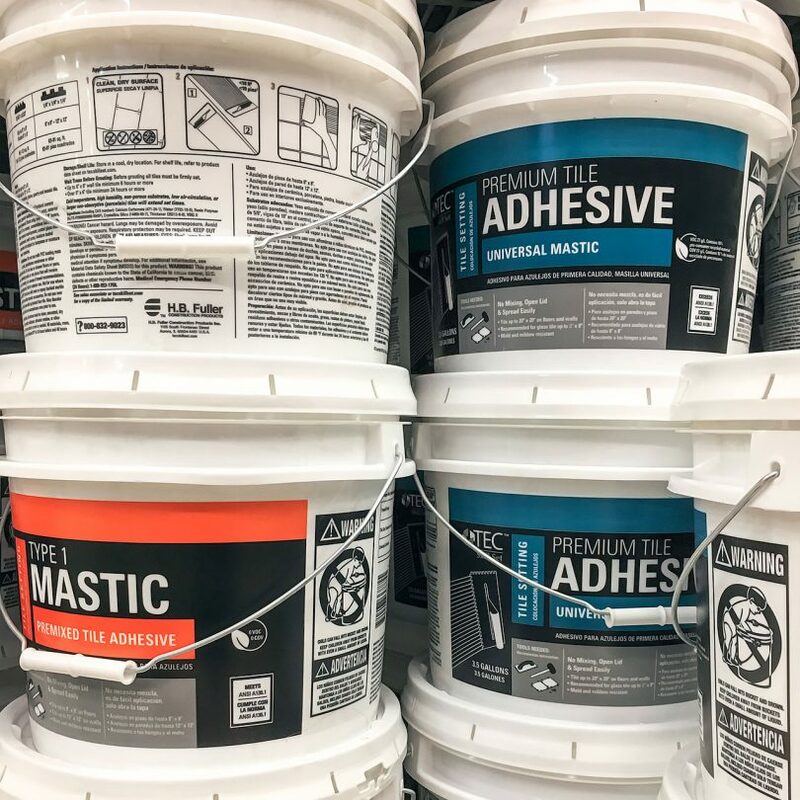 Paint breaks the bond between the tile adhesive and the concrete. As the paint starts to go, so does your tiling job! It could last a good long time, but then again, maybe not. I’m not about to put a bunch of sweat equity in only to have it fail because the surface wasn’t prepped properly to start. The paint had to go. 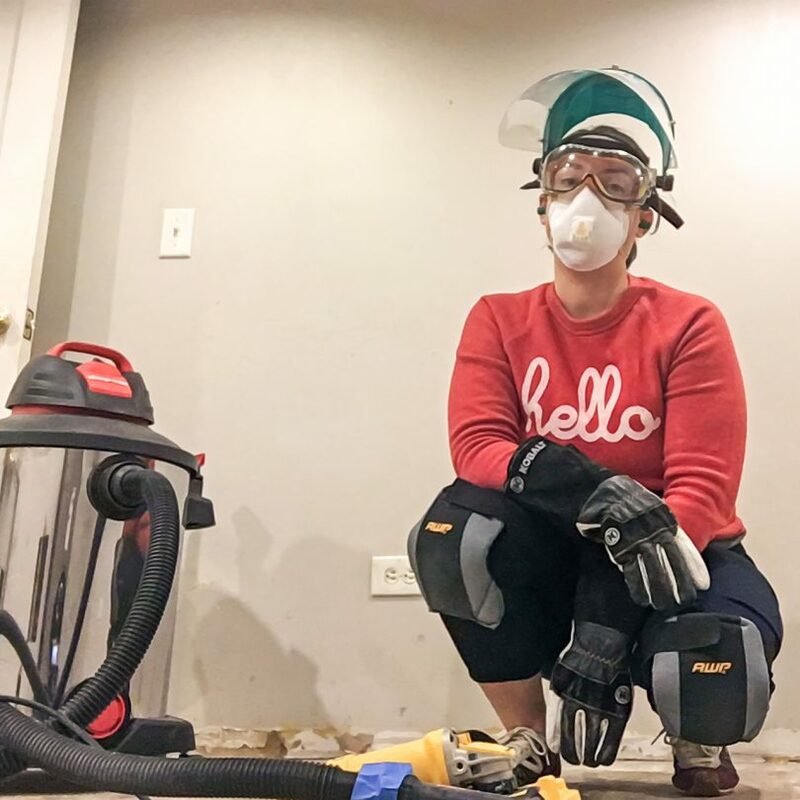 You can’t use a chemical stripper because concrete absorbs it and again, the adhesive wouldn’t stick. So what to do? There are basically three options. Handheld scraper with a 4″ razor blade. Slow and tedious work, but if it works it works. Unfortunately for me, it didn’t. The paint was barely budging. Angle grinder with a diamond cup wheel. This is what I moved on to. A little faster, but it still takes some time. It grinds the top layer of concrete right off, and with it, the paint. I have a dust shroud attached that hooks up to our Shop-Vac and the dust has been minimal. It does spark every so often though, and it scares the pants off me! I don’t even like Fourth of July sparklers, so loud noises plus dangerous spinny tools plus sparks is not a whole lot of fun. Floor buffer with a diamond cup wheel. I could have moved right along to the nuclear option, but if the angle grinder was freaking me out, how bad was a much larger machine going to be!? I imagined the buffer taking off like it does in sitcoms, but this time with a blade capable of grinding concrete attached and spinning out of control. While researching the options and watching YouTube videos for techniques, I came across this one calling the angle grinder “the most dangerous tool in a workshop.” Well that’s just great. You better believe I’ve been wearing all of the protective gear recommended. Here’s this guy without my dumb fears (and without much safety gear), making it look easy. And then there was me. Skin covered. Welding gloves. Safety glasses and face shield. Ear plugs. Dust mask. Anxious knot of fear in stomach. Look at the excitement in my eyes! Look at that can-do-it attitude! I got started and it was working, but it shot off sparks randomly, maybe every 10-15 seconds. I felt kind of dumb for being afraid. I like being able to do things myself. I don’t need help! I’ve got this! Yeah, not really. I put the job off and finally asked Brandon if he would please do this part for me. He was all on board until I told him that part of why I was so scared was that I was working near the capped off gas line and what if it wasn’t really OK and it was leaking but we couldn’t smell it and then a spark ignites an explosion and the whole house blows up with our family inside!? So he did it for me and probably wished I hadn’t passed on my inner anxiety. But it took two nights, it’s done now, and I’m very thankful! Just about ready for tiling. 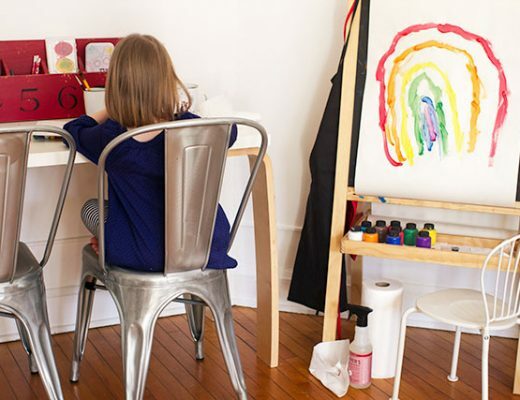 Would You Rent Out Your Home Office? We literally did the exact same thing on our screen porch last week! 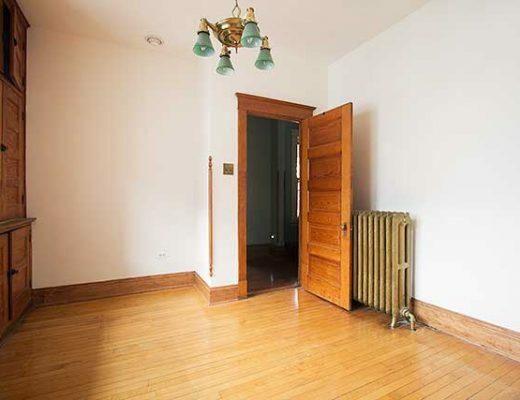 We rented a floor grinder which weights 200 lbs – literally – and We went for “good enough” instead of every speck of paint removed. Most of the tiles will have a lot of bare concrete under them which should be enough for a bond. I’d be more concerned if they were on a wall instead of a floor!! Can’t wait to see how your project comes out! Power tools AND a gas line?! I’m such a scaredy cat I probably would have changed my design plan! (Or hired some nice person to do it while the fam and I were on vacation in another county…) Now that it’s done though, you’ll probably forge ahead like gangbusters! Yikes! What an ordeal! I had no idea that painted concrete couldn’t be tiled over – I’m sorry you had to learn the hard way! I have painted concrete in my basement and I’ve tried to figure out what i could put in down there but never figured out that an angle grinder would take the paint off. I also have a painted (very chipped) concrete front porch that I’ve wanted to clean up and stain but couldn’t figure out how I was going to get all the old paint off. Thank you for pointing me in the right direction. I’ve probably do the porch but I’m not sure the basement is worth that much time on my knees wearing a respirator. The things you get yourself into! Wow. I think I would repaint the floor in a wild design rather than go through all that! A few years ago I painted a bare cement floor in a lower level bathroom knowing it would be a while before I would have a floor put down. When the tile guy showed up he said, “I can’t tile that,” I didn’t understand why and he didn’t explain it. He actually just went ahead and tiled it still painted. Now I kind of wonder how it’s holding up (for the new people). I’ve lived in a rental for 4 years with painted concrete. It looked okay for about 6 months and then began peeling really terribly. Whatever they did to prep the concrete (nothing?) before painting did not work. It’s made me realize when I own a home, I never want any painted floor. I can literally sit there and peel the paint off in big sheets and have thought about just peeling up the whole house haha. 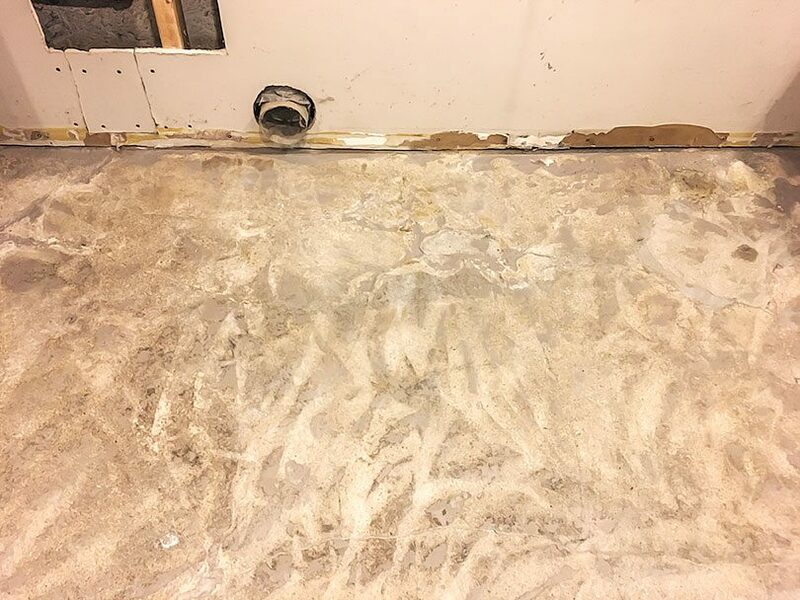 Glad you figured out a good prep solution–I bet your tile will be beautiful! I’d also add two pieces of advice, based on my experience: 1) Don’t wear yoga pants or any other stretchy/non-natural fiber fabric/shoes, the sparks will melt little holes in them. 2) If you have small hands, those big leather work gloves can make it hard to feel like you have a stable grip on your tools, so get yourself a pair of leather rose pruning gauntlets. They fit much better!